Lettering on the Cheap is proud of our customers! We love seeing the innovation and creativity they build upon with all of their vinyl solutions. From weddings, to bedrooms, bathrooms and nurseries, vinyl makes for a smart choice and sleek solution to any of your creative needs. In our current world of D.I.Y. blogs and Pinterest boards, it is easy to find inspiration for livening up your home. I myself have a Pinterest board dedicated to house projects and am often browsing the ocean of blogs to find the next idea for my abode. Lately I’ve noticed a trend in wall lettering and graphics. It’s a sweet and personal way to communicate who you are and how you feel about life to your loved ones and the people that visit your home. Whether it is in your living room for all to see or displayed in your bedroom as a personal encouragement, you cannot go wrong with this way of home décor. I’ve seen some pictures where wall lettering was D.I.Y.-ed with a can of paint and some brushes. I envy those who can do that and successfully make it look presentable. Unlike the coordinated few, most of us need some help. We may know where we want to place the lettering, and we may have even designed it ourselves in Photoshop, but transferring it from our minds to our walls can be easy if we look for help in the right places. At SpeedySigns, we can provide all of the inspired lettering your decorative heart desires. Want your initials boldly placed about your bed? No Problem. How about cute pirate-themed graphics displayed in your kid’s bedroom for extra imagination? We can do almost anything that will communicate your home’s message. We also offer vinyl lettering and lettering for boats, vehicles, windows and specialty items like bicycles! It really is your one stop shop for creative communication. Let today be the last day your walls keep silent. 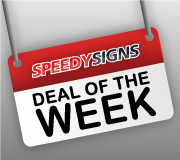 Visit SpeedySigns.com and let us help you make your house a home.